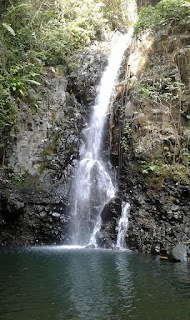 Dung Paso Somosari Waterfall, Batealit in the past month is booming. This is why I took the time to visit while I was in Jepara. Arriving at the parking lot; there are already many motorbikes. The trip to the parking lot was a little choked up, my group had to share the road with the visitors who began arriving towards Sumenep Waterfall. Some of them are teenage girls. I forgot how many times I saw visitors slip and fall on the road. They use shoes like visiting a mall. Not far from the parking lot, I and the group of small children cleaned the body in the shower. "Has anyone been guarding the parking lot !?" Majid said in surprise. "Four motorbikes and one bicycle, how many sir?" "20 thousand, bro. Bicycles don't have to pay for parking. " I offered 50 thousand, and took change. The local village children did not expect to be charged with parking and they breathe freely. "Just stay here, bro. We ride motorbikes together to Dung Paso, "suggested Faiz. "Okay, but I don't dare in front. The road is very scary," I said, "get my hand"
I took the bicycle and returned to the parking guard father. Eight of us continued our journey to Dung Paso Waterfall, which is not far from Air Tejun Sumenep, Dung Paso Waterfall is located in Hamlet Kedawung, Somosari, Batealit. The distance from the parking lot to Dung Paso Waterfall is around 1km, but make no mistake; even though it's only that much but it must be taken longer. Path, broken, slippery, hollow; and if there are two motorcycles passing each other, one of them becomes an obstacle. To get to the parking lot that has been provided, many vehicles have to fall in the hole, or even fall repeatedly like a motorbike driven by Tabah & Faiz. During the trip I stopped, lifted the motorbike whose wheels had fallen and could not walk, even twice lifted together with the steadfast motor that had fallen. Inevitably the muddy red soil pollutes my shirt. Along the way, many tourists who deliberately walk away avoid incidents like what happened to us. Even here I have to give up my sandals. So that I returned to Jogja I had to wear broken sandals. Dung Paso Somosari Waterfall, Batealit in the past month is booming. This is why I took the time to visit while I was in Jepara. Arriving at the parking lot; there are already many motorbikes. A small bridge made of bamboo is a crossing road. I saw that in the river there were many people who bathed / played water. While on the edge are also some visitors who sit relaxed while enjoying the natural atmosphere that is still beautiful. The water is still very clear, so people don't hesitate to soak their bodies to bathe here. My comrades don't want to lose; some are still arguing that they will take a shower below or here, some have already undressed and bathed like Faiz did. "Don't go to the middle, Iz. In that, "I shouted from the rocks. "Calm down, bro. Faiz can swim, "said another. The debate between my small group ended, we decided to take a bath at the waterfall below. Down the emergency road that is only a footpath, we arrive at the edge of the cliff. From above there was a scream of people below playing water. I turned my head while holding one of the logs, a waterfall flanked by a cliff wall. I didn't see anyone below him, but his voice was very noisy. While many people are on the cliff looking down. Be careful I go down the cliff, there is a dead log used as a walk down, besides that the foot must also be able to choose which stone is not slippery. Whereas under the flow of water is very heavy. At the bottom, I was between two long cliffs that were only about 3 meters wide. The water here is thigh-high, I have to step on the rocks so that it doesn't fall into deeper water because it carries a camera. From here the origin of the cries of people who are heard above, the visitors gather into one on the cliffs. Alternately they jump to the middle. According to local residents, the depth in the middle is more than five meters. Whereas at the other end the waterfall looks heavy, on top of it is the bathing place that I captured earlier. Really beautiful scenery here. "It's only as deep as the waist here, bro. The camera is wrapped in plastic so it doesn't get wet, "a local youth advised me. I said yes, I put the bag and shirt on the river bank together with the bag of other visitors. From these new friends, I got information about the discovery of Dung Paso Waterfall. I stepped closer to the visitor who took turns jumping while holding the root that rose from the tree. At first glance they do like the action that is often carried out by Tarzan. From the rock cliffs, he held the natural root lever, then they jumped to the middle and let go of the handle. Dung Paso Waterfall does offer a beautiful view. Rock cliffs look shiny wet. Meanwhile the visitors were still enthusiastic in queuing to be able to hang and throw their bodies when they were in the middle. Not only that, there are more extreme visitors. From above, where we passed to get to the bottom, there was a shout that the visitors below did not hang first. In an instant I saw people freezing from a height of 7 meters. His body slammed down like an arrow accompanied by a long shout. For a moment I was shocked without being able to capture the fast moment. I was not finished with surprise, back from the top there was another who plunged free without using the life jacket security. "Come on !! It's really desperate, if I definitely don't dare, "I said to the same age as my side. "Hanging is already mainstream, mas. Here people are used to plunge like before. "He replied laughing. For visitors who are already accustomed to free fall down it is an extraordinary sensation. But don't ever try it for those who have not been good at swimming, or who are already skilled at playing but are not sure about the action. It's better to undo your intentions, and play swimming like I do. A moment later I climbed the cliff and captured those who were queuing to play hanging. I approached Didin, one of my friends who had met in the Pine Forest. I put the camera wrapped in plastic on it. "Please take a photo later, when I play water again," I said, showing the button that was later pressed. I headed for the deep stream of water at chest level. Then swim near Didin who is ready to capture me. Didin did not find it difficult to capture me. Here, I play water to my heart's content. Back to swim, but did not intend to participate hanging like most visitors do. I am too weak in such matters. Even though I can swim, and the beach child; but I'm not used to swimming in fresh water. Even if swimming in fresh water is definitely in the pool. Long time I enjoyed the atmosphere at Dung Paso Waterfall. Chat with other visitors, most of whom have also visited this tourist destination for the first time, then take turns wearing floats (car tires) that are rented out. Without forgetting, I also immortalized myself with my little friends or with a friend who had had a chance to chat at length with me here. Whether you realize it or not, Jepara has a variety of tourist destinations. From beaches, caves, even waterfalls. Dung Paso is a newly known waterfall, the access road to here is very difficult. No matter the distance; but the steep road and the path. If the rainy season, this road will be more slippery and very difficult to pass by motorized vehicles. Hopefully local residents can build roads with the help of related parties. 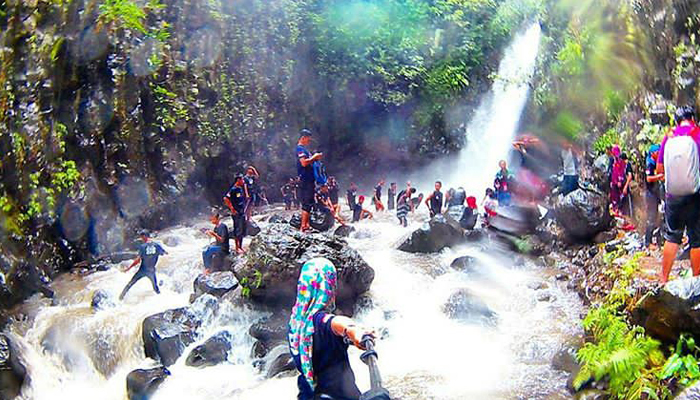 If road access can be better, it is not impossible that Dung Paso Waterfall, Sumenep Waterfall, and other waterfalls in Batealit can become natural attractions such as Songgolangit Waterfall which was already known. The hope is that this place is still clean and not littered with garbage. Anyway, it would be more interesting if in Dung Paso Waterfall was made for canning. Because the rock cliffs that squeeze the waterfall are quite high and worthy of being used for canoning. With a heavy heart, I left Dung Paso Waterfall. We hurried to leave this place because we saw the sky getting cloudy. Afraid, if it gets rained, the motorbike that the kids drive is in difficulty to ride.